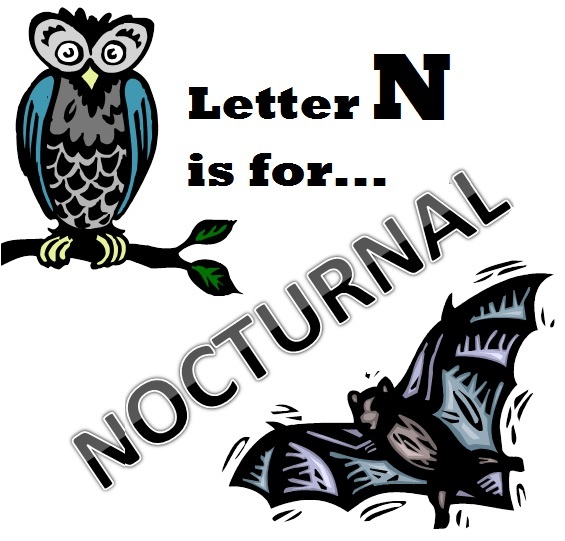 “Letter N is for Nocturnal Week” is next! “Letter M is for Math Week” was Magical, Marvelous, Magnificent, and Miraculous (not to Mention, Much easier to find adjectives for than some of our previous letters) 🙂 Throughout the entire week, the students were hard at work discussing numbers and practicing their math skills all the while having a blast! The letter M share box seemed to be filled with Millions of letter M items! Take a look below to see some of the Many M shares that Made their way in this past week – one share, in particular, was too funny not to share! On Monday and Tuesday morning, the students took a break from the mathematical morning stations do start their morning work! One by one, each student came over to complete their letter M tracing and identification activity sheets. Some of the M words included: mailboxes, moons, monkeys, muffins, and more! The teachers were very impressed with the quality of the students’ work. One after another, the students meticulously colored and completed their pictures then held up their work for the teachers to admire. Later in the day, the students created a letter M word list and went hunting for M’s around the classroom! 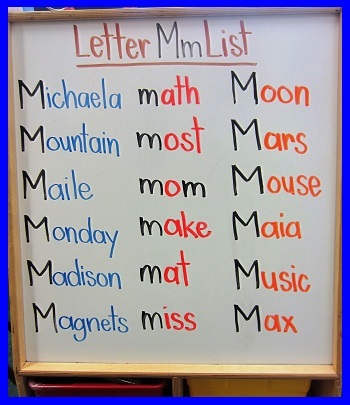 Here is the letter M list they came up with. The students were thrilled to learn that a PPA Mommy was visiting on Monday afternoon to read a story to the students. What an exciting day it was! Thank you to the Mommy below for spending the afternoon with us! The art exploration of math began on Wednesday as the students designed their very own Mathematical Multi-Colored Macaroni Necklaces! Phew! Talk about a lot of M’s! After stringing together their necklaces, each student worked individually with a teacher to count the number of each color macaroni. Whether the goal was to correctly identify the number to match the quantity, to write the numeral itself, or to add all the quantities together, one thing was for sure – the kids had a blast practicing math! Take a look below to see the students in action! During the afternoon on Wednesday, the students were ready to practice more math but this time it would be through another letter M word – Movement! Thanks to Miss Noel, Miss Devon, and Miss Taylor, pictured below, the students had the chance to do so and boy, did they have fun! Miss Noel is the creator of Work It Out, a fitness/gymnastic studio for children and adults with two locations in Hoboken. Miss Noel, Miss Devon, and Miss Taylor did such an incredible job working with all of the students and incorporating the theme of the week – math – into all of the activities! Whether they were counting out the number of movements in a set or the number of seconds to hold a position, one thing was certain – they LOVED doing “movement math” with the ladies of Work It Out Studio! 🙂 A special PPA Thank You to Miss Noel, Miss Devon, and Miss Taylor for teaching us all about staying fit and gymnastics! The ladies even left behind some materials for those students (or parents) who want to keep “Work(ing) It Out” (see Miss Justine or Miss Jocelyn if you are interested). 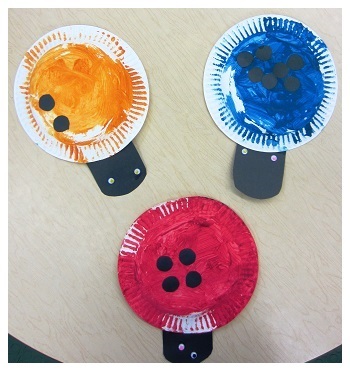 On Thursday, the students clearly had math – and ladybugs – on the brain! Starting their day with a read aloud of Ten Little Ladybugs, the students learned that they would be counting lady bug spots later that day! Can you count the spots on all three of these ladybugs? In the afternoon on Thursday, the students had Spanish where they took a break from their current unit of study – La Comida (food) – to revisit Los Numeros (numbers) vocabulary. Also on Thursday, the students were visited by an older sister and PPA alum who came in to be a guest reader for the class before celebrating her brother’s fifth birthday! What a special day it was! On Friday, the students spent the morning counting stars! Wait, how did they count stars in the morning when we really only see the stars at nighttime? The students used their imagination, of course! After selecting a handful of stars, the students were asked to count them out and fill their sky with stars! Naturally, they had to put the stars in the sky and practice identifying or writing the number below. Friday afternoon wrapped up with Spanish class as well as a mathematical technology presentation! The students loved the interactive style that allowed them to practice their numbers in a really fun way! The students, even the youngest ones, were able to follow along and complete basic addition and even subtraction word problems! Wow! Talk about an exciting afternoon of math! Try it now with Pirate Subtraction. Wow! Talk about impressive math skills! Well, that is all for “Letter M Week” but the math fun will surely continue as we head into next week. As always, thank you for reading. Have a fun and safe weekend! Please return your child’s library book if you have not done so already.